Liverpool and England footballer Steven Gerrard is to follow Lord Harold Wilson and become an Honorary Freeman of the borough of Knowsley. The midfielder, who was brought up in Huyton, is to be given the honour for his outstanding contribution to national and international football. Members of Knowsley Borough Council voted unanimously to give him the honour at a meeting on Wednesday. It will be the first time the honour has been bestowed since 1988. 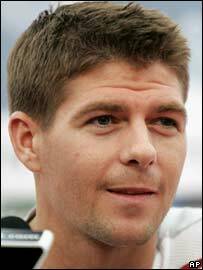 Gerrard was born in Whiston and grew up on the Bluebell estate in Huyton, went to St Michael's School in Rupert Road (now Huyton with Roby Primary). He was spotted by Liverpool FC scouts aged nine while playing for Whiston Juniors. Cllr Round said: "Steven is an exceptional talent and a real ambassador for the borough of Knowsley. "Despite his phenomenal success on the pitch he is still a Huyton boy at heart and is the first to acknowledge the influence of his roots. "He's thoroughly deserving of this honour." The 26-year-old captained Liverpool to win their fifth European Cup triumph against AC Milan in Istanbul in 2005.